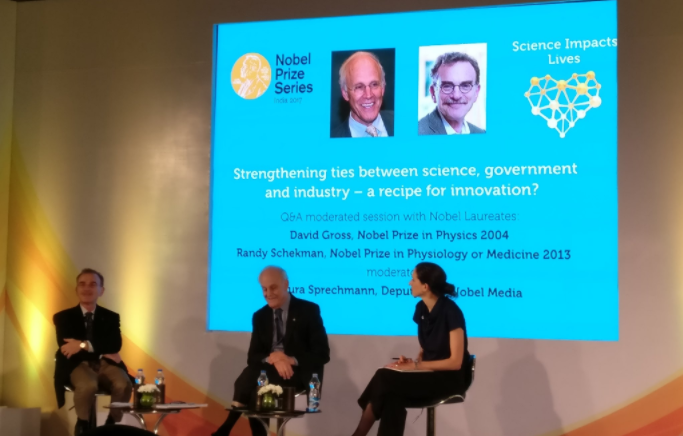 A packed hall greeted Nobel Laureates David Gross and Randy Schekman at a recent Q&A session—Strengthening ties between science, government and industry - a recipe for innovation? Held at the ITC Gardenia Hotel, Bangalore on 13 January 2017, the event was part of the first edition of the Nobel Prize Series - India 2017. The session was moderated by Laura Sprechmann, Deputy CEO and Director of Partner Relations, Nobel Media AB. The initial questions from the moderator sought to understand what innovation might mean to the various stakeholders—scientists, politicians and industrialists—and their roles and responsibilities in maintaining a dialogue and paving the way forward for science. “Politicians should appreciate how science is done, its limitations and how it can impact society,” said Schekman. He recognised the role of scientific societies in the US in keeping Congress informed of developments. While Schekman acknowledged the enormous importance of philanthropy and the value of encouraging them via incentives, Gross reminded the audience that most science is supported by public funding. “Science should be public, delocalised and independent,” insisted Gross.This is essential, he argued, since science is a meandering, long-term enterprise, in contrast to the short-term gains that industrialists, and often politicians, routinely seek. “Innovation means new ideas and all big changes come from curiosity-driven projects. Top down projects rarely work in favour of discovery and innovation, especially with deadlines,” said Gross. In response to questions about what India can do to foster science and innovation, Schekman suggested creating more opportunities for hands-on learning in schools and colleges, as opposed to rote learning. Gross agreed that higher education reform is critical. He also urged that we pay heed to the increasing gap between elite universities and the vast public education system [in the US and] in India. He believed that attractive opportunities to do good science would bring back talented NRIs and attract foreigners. He was surprised that India does not allow dual citizenship—an option that many expatriates would favour. When their turn came, the audience were eager to pose a wide variety of questions—about collaborations, big science and the effect of publication pressure. “How do we keep scientific discussions balanced in national discourse?” asked an audience member. Gross said that politicians must shoulder responsibility; many don’t have the political courage to take rational positions in the face of opposition from public opinion. Schekman believed communication is key. “We have to rely on spokespersons who are articulate and can talk the language that people can understand. More effective communicators important in times like these, “ he said.